Gum disease, also called periodontitis, is an inflammatory condition that affects the tissue surrounding the teeth. Caused by plaque and bacterial buildup, gum disease is progressive and can result in tooth loss. It begins as a bacterial infection called gingivitis, which causes the gums to become inflamed. 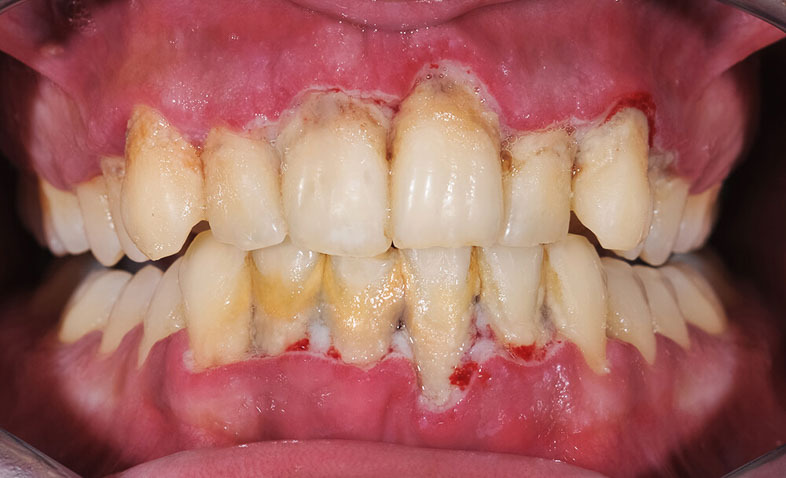 When left untreated, the plaque toxins destroy both the gums and the bone underneath, causing damage that affects how a person looks, chews and speaks.There are several types of gum disease, notably necrotizing periodontitis and periodontitis that is caused by another disease process in the body. Each type is distinct and requires immediate treatment from a dentist. Many people do not know they have gum disease because it can occur and progress without pain or other symptoms. This is why annual dental checkups are so important. The most common signs of gum disease are outlined below. If the gums appear inflamed or are painful for no specific reason, it can mean there is an infection present. This type of infection can advance quickly, and it is critical to stop its progression. A lack of treatment can lead to bacteria reaching the bloodstream and affecting other parts of the body. When the gums bleed during eating, flossing, and brushing, it is an indication that gum disease is present. When plaque builds up between teeth, it produces toxins that lead to a bacterial infection, which makes the gums sensitive and prone to bleeding. It should also be noted that hormonal changes such as pregnancy and menopause can make the gums more prone to gingivitis and bleeding. Foul-smelling breath can be the result of foods that were eaten and originate from the stomach, the lungs or from the back of the tongue. It can also be caused by smoking or oral tobacco use. In many cases, it is caused by food particles that become caught between the teeth and eventually work under the gumline. Those who have deep gum pockets are more prone to storing food debris, which leads to bad breath. It’s not a serious issue since there are many solutions to bad breath. Periodontal disease can cause the gums to recede from the teeth, making them appear longer. This gives a person a “toothy” smile. The recession occurs when bacteria damages the tissue and bone structure underneath. When pus appears between teeth and begins to ooze out, it is a very clear sign of gum disease. Plus is made by the body when it is trying to fight an infection process. At this point, a person may require antibiotics before any dental work can be done. When gum disease reaches an advanced stage, teeth will loosen and shift to different positions in the mouth. This is caused by the destruction of bone tissue from an untreated bacterial infection. When a person reaches this level of gum disease, extensive work may need to be done to save the teeth that have not already been lost. Anyone who is experiencing these symptoms should visit a dentist or periodontist immediately as any stage of gum disease can affect overall health. The objective of gum disease treatment is to halt progress before it causes any more damage to the tissues and bone. The dentist will begin by thoroughly examining the mouth to determine how far the condition has progressed. After diagnosis, the dentist will proceed with a treatment plan, which may include a course of antibiotics and surgery. In moderate cases, the pockets surrounding the teeth will be cleaned through a method called scaling and root planing. The dentist may choose to fill the pockets with an antibiotic solution to eliminate any remaining bacteria and ensure proper healing. • Flap surgery – In this procedure, the dentist directly manipulates gum tissue to reduce the size of the pockets around the teeth. Smaller pockets are easier to keep clean and reduce the chance of harmful bacterial buildup. • Laser treatment – Similar to flap surgery, laser treatment makes pockets smaller and easier to maintain. • Bone and tissue graft – In cases where a large amount of gum tissue or bone has been lost, the dentist may choose to use a graft. This procedure involves applying a membrane to help the body grow new tissue and bone. Gum disease is easily prevented by daily brushing, flossing and using an antiseptic rinse. Flossing should be done after each meal to dislodge any food debris left behind. Brushing for a minimum of two minutes removes plaque. The rinse will kill harmful bacteria and promote healthy gums. Aside from daily care, visiting your dentist every six months for an exam and professional teeth cleaning will keep the teeth and gums in optimal condition.